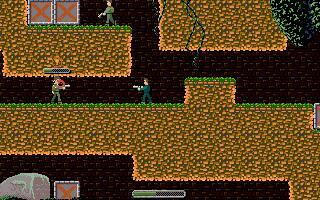 Entry for MAGS-contest 09/2007 'Revelation' is a stealth/action jump'n'run game. It also allows you to create your own levels easily! A very nice application. I really like the way you've implemented the level designing. Interesting application of AGS. It is a good concept but too simple in execution (of course, it was a MAGS game, so made in a few weeks). I'd like to see an enhanced version some day. Heh. You will pick up items automatically. However, with the health-potion, you won't pick it up if you already have 100% health (the healthmeter is the big bar on the bottom of the screen). One problem--I cannot figure out how to pick up items. I don't see anything in the readme telling which key does this. I stood on a health potion and tried lots of different keys but couldn't pick it up.